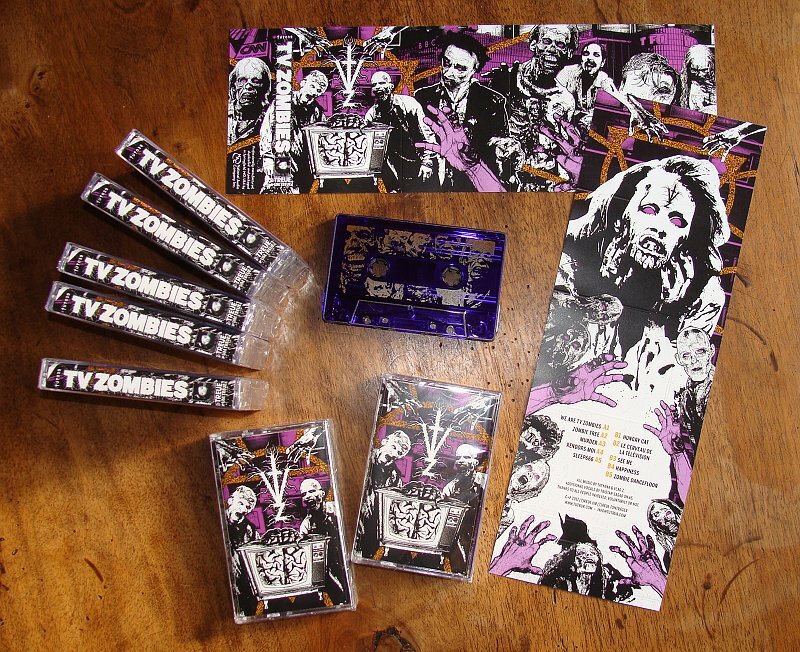 TV ZOMBIES from Paris, France, is the joined effort of MACHINE MORTE (also known as ZENOVONZAN) and SANTA ESPINA (who released an album on Black Horizons and collaborated with J. Weber as SUSA24). After a couple of extremely limited 7-inches on their own imprint Création Par Le Vide (which are included on this album), here comes the first long player of the French twosome. Feasting on 1930s Surrealism and early zombie flicks, TV ZOMBIES succeed in creating a chilling atmosphere of delicate spookiness, archaic gloom and haggishness that will give you the impression that some evil ghoulish creature is right behind you, just about to drag you into the smokey black swamp of modern mass media hypnosis. Old fashioned organs, eerie HERMANN KOPP’ian melodies and infernal sluggish loops offer the perfect backdrop to Santa Espina’s husky monotones, seeming to emerge from the beyond, all summoning the monstrous Golem of our modern times… This is the real unsurpassed horror that lurks in this day and age. Are you awake? Or are you still sleeping?